With a lofty goal of 33% of state electricity to come from renewable sources by 2020 (and 50% by 2030), it seems that the western state has committed to blazing the trail for American solar. And given the California Independent System Operator's recent announcement of a new solar generation peak on its grid, it appears they just might. California's cemented status as a solar super power has developed in large part due to its innovation industry, incentives, and varied means of energy generation. Beyond actual generation, California is a haven for innovation related to solar, and home to more than 100,000 solar industry employees employed by about 2,900 individual companies. While big players such as SolarCity come to mind, the state is also a hotbed for businesses and research specializing in energy storage, solar powered machines and devices, and consumer-side technologies such as benchmarking and monitoring platforms. As a state with one of the highest electricity bills and the most sunny days in the country, there's a clear incentive for residents to adopt solar. With the renewal and extension of the capacity cap of net metering last year, Californians can rest assured that their excess power will be returned to the grid to their financial benefit. California's net metering program grants solar owners with retail rate bill credits, making ownership an appealing option for property owners. Recent amendments have added non-bypassable charges (NBC) (2-3 cents/kWh), a one-time interconnection fee (between $75-150), and Time-of-Use (TOU) rates that result in higher electricity during peak demand hours. The ultimate result is a slightly higher cost to solar owners, though the TOU rates stand to provide higher profits during late afternoon and early evening peaks, when solar electricity can be sold back to the grid for higher prices. Time of use is an important factor-- as illustrated in the 'Duck Curve'-- is incredibly important when considering strategic generation. The effective load (or electricity demand) of the state balloons downward during midday, when wind and solar generation spike and offset the amount of fossil fuel-derived energy necessary to satisfy the grid. 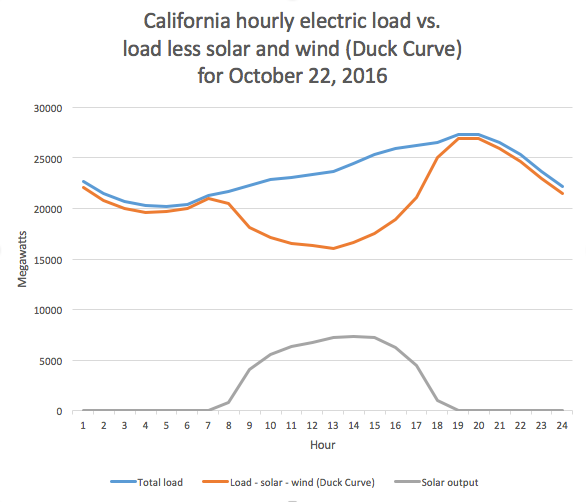 As the sun sets and Californians return home from work to use appliances and energy, the two lines converge during a time of peak demand. Within the state itself, some cities and municipalities have expanded the incentives available. In San Francisco, cash-back perks can range from $2,000 to $10,000, depending on household income. Statewide-- as with other programs throughout the nation--, California offers additional aid for projects serving multifamily and lower income areas. While many states rely upon simplistic solar panels to generate solar energy, California has the technology, space, and financing to explore alternatives. Some of the world's largest solar generation systems (second only to Israel's recent project) feature a hybrid of technologies to produce power. Once considered improbable or even infavorable, veritable "solar plants" have become commonplace in California; multiple projects including the Solar Star, Topaz Solar, and Ivanpah Solar facilities each have the ability to produce enough power equivalent to the demand of more than 160,000 homes. While Solar Star and Topaz Solar are predominantly comprised of solar arrays, Ivanpah distinguishes itself from the rest with its design. Exemplifying what is known as concentrated solar thermal power, Ivanpah's design features a central collection tower surrounded by solar panels angled to concentrate the sun's reflectance to the top of the tower. Given the sizable footprint and specific requirements of this variety of system, concentrated solar is best suited for utility scale installments located in deserts far from residential areas. California is currently home to six concentrated solar plants, ranging from 5 to about 392 MW of capacity. Additional expanses of desert are being considered for large-scale development, optimizing an ecosystem that is largely unused and comprises large tracts of California's land area. California still has the ability to improve solar expansion. Recent changes to rate charges have shifted peak hours to later in the day, posing a threat to those who reap the benefits of net metering; the cut can result in a loss to homeowners of up to 20 or even 40% of the value produced by a PV system. But it seems that the Golden State will continue to set its sights high; last month, state Senator Kevin de Leon introduced a bill requiring California to reach 100% renewable energy by 2045, and the SEIA predicts an addition of 14,180 MW of new capacity in the next 5 years. 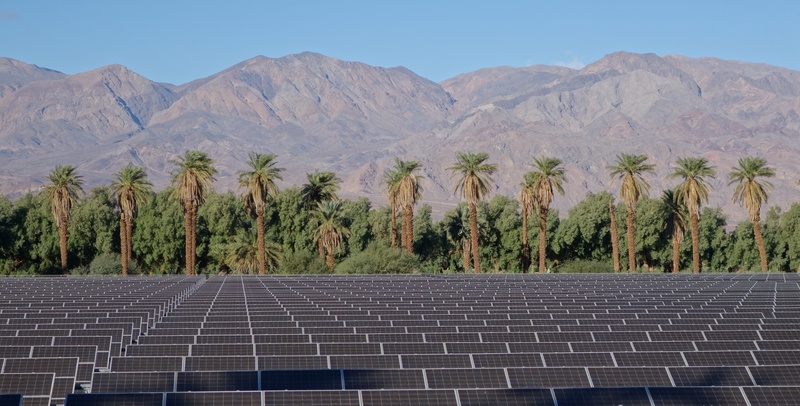 Though California-- like the rest of the states in the Union-- has a ways to go, it doesn't seem it will relinquish its position as the leader in American solar.